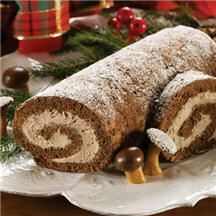 With a light dusting of 'snow', this festive yule log features a chocolate cream center that melts in your mouth. Decorated candy 'mushrooms' add an unforgettable winter touch that is sure to impress. For Cake: Preheat oven to 375°F (190°C). Grease 15 1/2 x 10 1/2 x 1-inch jelly-roll pan; line with parchment or wax paper. Grease and flour wax paper. Sprinkle thin, cotton kitchen towel with powdered sugar. For Chocolate Cream : Beat whipping cream, granulated sugar, baking cocoa and liqueur in large mixer bowl until firm. If desired, fold in ground nuts. Carefully unroll cake. Spread cream mixture evenly over cake, reserving 2 tablespoons. Re-roll cake. Tip: The filled cake can be kept in the refrigerator overnight or wrapped airtight and frozen for 2 weeks. Keep wrapped and thaw in the refrigerator.